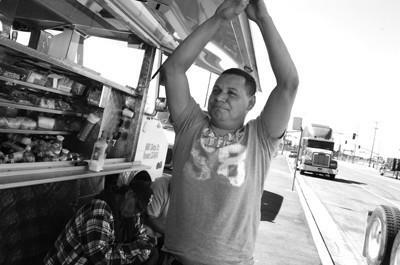 Trucker Waldo Santos waits for work. The Port of Oakland, as part of a broader plan to alleviate pollution and poverty in West Oakland, is considering imposing fees on truckers doing business there. The plan represents the port's initial response to community pressure to seek a reduction in West Oakland's high asthma rates by reducing pollution from container-carrying trucks. Union groups have also been seeking employee status for immigrant drivers who work for paltry wages as independent contractors. The port's plan, which is still in the discussion phases, aims to provide training programs to help solo drivers who want to grow their own businesses. It would also encourage truckers to upgrade their vehicles to meet 2007 engine-emission standards, something the state also will likely be requiring in years to come. "We are not trying to put people out of business, and we don't want to be in that position," said Ray King, general manager of the port's maritime division. "But we are trying to accomplish our goal to clean up the environment." As part of the program, all trucking companies and independent operators working at the port would pay an annual fee, still under review, but likely in the neighborhood of $3,000 to $6,000 a year per truck, according to King. The money would help fund training programs as well as hiring programs for West Oakland residents. Truckers who drive older, polluting trucks would also be charged an additional fee each time they picked up cargo at the port. This revenue would go to a truck-replacement program, providing grants to help drivers purchase new vehicles. State funds, possibly from the air quality bond measure approved by voters last year and other port dollars, could also be used. Labor is marrying environmental concerns with the plight of the drivers. Change to Win, a group of unions that split off from the AFL-CIO, as part of its first national organizing campaign, and the Teamsters say independent contract drivers are too poor to maintain their aging trucks or to upgrade them to burn clean fuel. In Oakland, almost 30 neighborhood, environmental and social justice groups, organized into the Coalition for Clean & Safe Ports, see the plan as a way to address poverty, pollution and high asthma rates in the area. West Oakland residents have the highest asthma hospitalization rates in Alameda County - 2.3 times the average - according to coalition materials. Similar proposals are being discussed at the ports of Los Angeles and Long Beach, although port officials there have not voted, and seem to be uncertain about how high to peg the fees. In Oakland, the port is setting a target of having just 30 percent to 40 percent of drivers doing business at the port be independents. That's a considerable drop from the 90 percent that the port estimates are independents now. No formal registry exists, but union officials estimate there are 1,500 daily users of the port and 1,000 who use it less often. Some 1,250 independent drivers earlier this year signed a petition telling the port they hoped to become port employees. A survey of 123 independent owner-operators by the labor group East Bay Alliance for a Sustainable Economy found the average take-home pay for drivers is $10.69 per hour after paying expenses. Twenty-five percent of them earned less than $7.64 per hour, just over minimum wage. A different study by the Gateway Cities Council of Governments found a 40 percent pay differential between employee and independent-contractor drivers at the ports of Los Angeles and Long Beach. "The port wants to give people the option to become company drivers or to become a company owner with their own employees," said Doug Bloch, a spokesman for the coalition, whose salary is paid by Change to Win. "We have heard a lot from the industry folk about the American dream of owning and operating your own business, and the port is trying to give them that, and that is something our coalition strongly supports." Yobany Hernandez, an immigrant from El Salvador who has been working as a solo driver at the Port of Oakland for 15 years, cannot afford to purchase health insurance for his family and would welcome the chance to be an employee at a company that pays him an hourly rate, instead of by the load. "If the company pays for everything and they pay us by the hour, then that would be good," Hernandez said. Bill Aboudi, who owns Oakland-based AB Trucking and manages one of two parking lots for trucks for the city, says the port should be holding the shipping lines, which run the terminals, responsible for long lines and pollution. He hires both employees and independent contractors, but says it isn't cost-effective for him to pay hourly wages for drivers who might wait all day at the terminal. "These guys don't know what they are making," Aboudi said. "That is the whole problem. They love to drive. They get in the truck and drive. They don't always make smart business decisions." Aboudi is working with a local trucking association, the West State Alliance, that he says has a competing proposal to organize companies and drivers into a professional association that would take over the responsibility of registering trucking companies and providing credentials for them. Drivers could get group discounts on professional liability and business insurance and access compliance to security certifications, and the whole system would be self-sustainable through fees paid by members. Drivers would naturally gravitate toward the better-managed motor-carrier companies, he says, and fly-by-nights and "low-ball" operators would be weeded out through market forces. "We are grateful to the Teamsters for shining a light on this, but we don't want to turn everything upside-down and hurt the community we work in," Aboudi said. Employee status, the unions say, would help the drivers gain access to benefits and overtime pay, and lift the burden of their maintaining their own trucks. That could also ease the pollution problems, since most independent contractors are poor immigrants who can't afford to pay to upkeep older trucks. Employees, unlike independent contractors, also have the right to organize into unions. King says port staff members are drafting a recommendation to adopt the plan on the advice of stakeholders and that the whole package could go before the port's maritime committee in November or December, with final approval by the board likely the following month. In Sacramento, an Assembly labor committee held hearings on the plight of truck drivers at the ports of Los Angeles and Long Beach. An Oakland session is set for 10 a.m., Oct. 16, at the Elihu Harris Building. The Port of Oakland, which was offering drivers $40,000 to replace aging trucks as part of a program stemming from an out-of-court settlement with the nonprofit West Oakland Neighbors, is also hoping to capture its share of about $400 million in Proposition 1B bond money earmarked to retrofit older, more-polluting vehicles at the port. The state's Air Resource Board is distributing the cash and encouraging matching-fund programs. The board is drafting regulations that could be approved in December requiring that by Dec. 31, 2009, all trucks accessing port facilities be 1994 models or newer, and have a diesel particulate filter installed. Trucks would need to meet 2007 federal emission standards before Dec. 31, 2009. On the homeland security front, the plan could help the Port of Oakland keep track of its drivers. "We have to prepare ourselves for TWIC," said King referring to the federal Transportation Worker Identification Credential program requiring those accessing ports to carry a photo ID, also with fingerprints or other biometric data. "The first test site is Delaware, and that is to happen this month or next." The port's plan also includes leveraging RFID and GPS technology to improve traffic flow and monitor trucks that park in neighborhoods. A stakeholder workshop to hammer out the details of the plan is scheduled for Oct. 6 at the West Oakland Senior Center, 1724 Adeline St., Oakland. Registration begins at 10 a.m., and the meeting will run until 2 p.m.